Home Cleaning Products are used for removing the dust and dirt from the surfaces for disinfection and maintenance. These are available in various forms of liquid, powder or spray. The main components of these cleaning products determine their place of applications. These products can be used for general purpose of cleaning or can be specified for special cleaning tasks like oven cleaning, drain cleaning, polishing furniture or lime scale removal etc. These cleaning products offer various hygienic and aesthetic benefits which are also associated with the safety and health of the users and the occupants of the building. In water the surface tension is lowered by using surfactants. The surfactants allow the water to flow easily through the crevices in soil and smaller tiny cracks which makes removal easier. The soils like mud and grease are broken down by alkaline chemicals. The soils like soap scum, lime scale and stains of mustard, tea, coffee and alcoholic beverages are broken down by acids. Varnish and paints are dissolved by the solvent based products. These solvent based products are flammable. Disinfectants are used to stop stains and smell caused by bacteria. Without removing the earlier substances, when multiple substances are applied on a surface, the chemicals have the chances of interacting. This interaction can emit toxic fumes and decrease the efficiency of the chemicals. It may be caused due to the mixing of acids with alkalis which leads to pH change like when acid based or ammonia based cleaners are mixed with bleaches. Chloramines are produced by this mixing of bleach and acids which becomes gaseous and can emit fumes. These cleaning processes should be carried out with caution. The places where these chemicals are applied should be vacant because the fumes can cause inflammation of lungs. Indoor air quality has an impact from the residue of cleaning activities of sweeping, vacuuming, dusting etc. and cleaning products. The particulate matter like the dirt, dust, organic matter, skin cells, animal dander, fibers from insulation, and particles from combustion, polycyclic aromatic hydrocarbons and pollen get redistributed in liquid and gaseous particles which become absorbed in the air quality. After cleaning there is highest concentration of chemical residual and particulate matter in the indoor air. It reduces gradually over time depending upon the air exchange rate, levels of contaminants and other sources of residuals. The VOCs or volatile organic compounds are released from the products of household cleaning like polishes, disinfectants, air freshening sprays, floor waxes, glass cleaner and all purpose cleaning sprays. Irritating vapors are emitted from these compounds. The release of VOCs should be a concern because it may lead to inflammation of lungs, childhood asthma, bronchitis, asthma, allergy etc. So these cleaning products should be used with caution and preventive measures should be undertaken. The cleaning chemicals which can cause irritation to the skin should be applied using rubber gloves or nylon scrub sponge. Cleaning products should be applied after comprehending and reading the labels. The tools which are used with the home cleaning products include the dustpans, brooms, mops, buckets, carpet sweepers, vacuum cleaners etc. 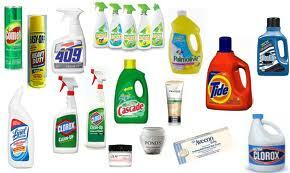 All types of cleaning products used for home are available online. Persons interested in these products can browse the internet and avail these products directly from the manufacturers.